A Day in the Life of a Super Mom: A Mommy Blog: Atlanta Braves "Girl's Night Out"
Atlanta Braves "Girl's Night Out"
If you're anything like my best friend and me, a night out with our Atlanta Braves kicking booty, is our idea of FUN! 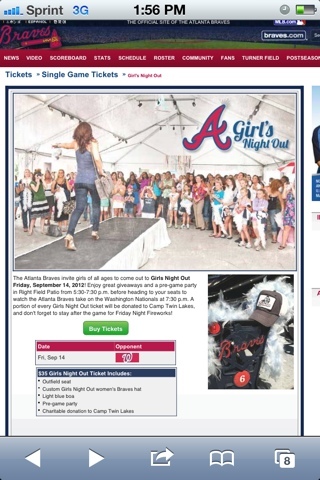 This Friday, Sept. 14, the Braves will be hosting "Girl's Night Out"! Sooo excited for this one! They will be having some awesome giveaways and a party before the game. Just be at the Right Field Patio at Turner Field at 5:30pm! And then watch the Braves SERVE the Washington Nationals! You might as well stay after the game too for the Friday Night Fireworks! Tickets are $35 and this includes an outfield seat, a custom hat just for gals, a light blur boa, the pre-game party, and portions of these ticket sales will be donated to Camp Twin Lakes! What a fun night this will be! Hope to see ya there!